As evidenced by several images showing crowded McDonald's locations across the country over the weekend, the fast food giant appears to have underestimated the demand for the one-day return of its Szechuan Sauce. While fans of Adult Swim's Rick and Morty and other hungry people found their local Mickey D's sold out of the sauce packets on Saturday, Wendy's was quick to capitalize on its rival's sauce snafu with its infamous snark on Twitter. It did not hold back. 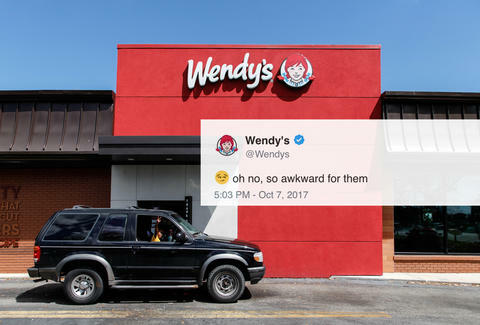 Wendy's has made a social media marketing strategy out of dragging other brands and complete strangers with hilariously savage jabs on Twitter, when provoked. Just ask Hardee's. So, when people started mentioning Wendy's in their tweets about the Szechuan Sauce shortage, the pigtailed fast food chain was anything but shy about unleashing fire in the form of 140 characters. Wendy's didn't mention McDonald's directly, but referred to the other company as "those clowns" and told one user they could find a McDonald's by following "the line of disappointed fans that didn't get sauce." Sorry you had to live through this. We'll be here for you. We'd say follow the trail of sauce, but there aren't nearly enough to make a trail. Just follow the line of disappointed fans that didn't get sauce. For its part, McDonald's issued an apology for not providing enough Szechuan Sauce to meet the insane demand and promised to release an even bigger batch of the sweet and savory chicken nugget accessory in the coming months to make it up to fans. "Szechuan Sauce is coming back once again this winter," the company said. "And instead of being one-day-only and limited to select restaurants, we’re bringing more -- a lot more -- so that any fan who’s willing to do whatever it takes for Szechuan Sauce will only have to ask for it at a nearby McDonald’s." McDonald's didn't say when the additional batch of sauce will hit stores, but you can safely bet Wendy's will be waiting. Tony Merevick is Senior News Editor at Thrillist and did no get Szechuan Sauce. Send news tips to news@thrillist.com and follow him on Twitter @tonymerevick.